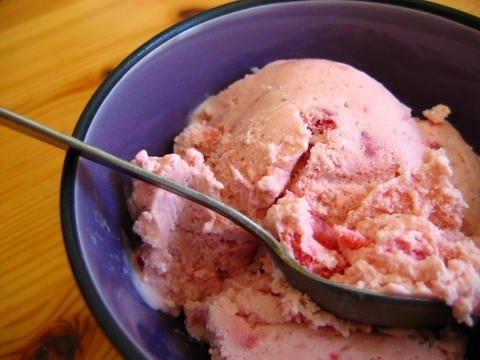 We made strawberry ice cream yesterday because it was sunny and that’s a good thing to do when it’s sunny. I arrived after the custard had already been made, which turned out to have disastrous results later. 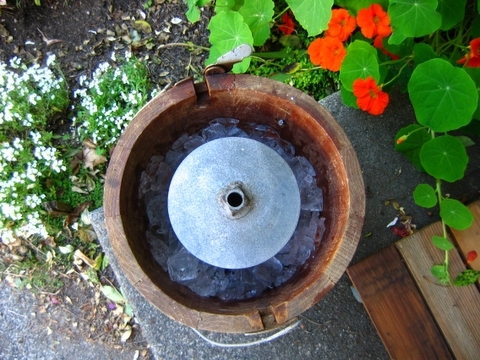 For those of you who haven’t made ice cream, the basic idea is that you make a custard and then you churn it while it is packed in ice and rock salt (rock salt lowers the freezing point of the ice, therefore magically making it colder). 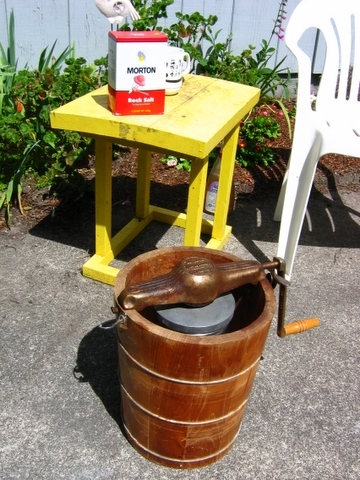 We’ve had this ice cream maker since I was a child–it’s a white mountain ice cream maker. I was going to get pictures of the innards before we put it together, but I was distracted. Inside the cylinder is a set of dashers, which are like giant spatulas that run all the way up the cylinder (to keep scraping off icy bits and churning the custard back into the center so it freezes evenly). This ice cream maker actually works by turning the cylinder around the dashers, which are anchored in the bottom. The churning takes a long time. 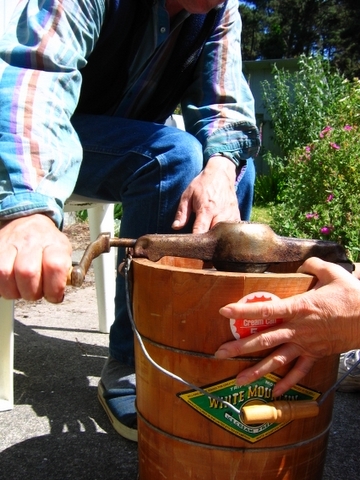 Around 1,000 cranks or 15 minutes of work will result in creamy delicious ice cream. At first the cranking is easy, because you are just pushing through thick milky custard. It starts to get harder as the custard freezes, to the point where you usually end up sitting on the ice cream maker to keep it from moving. After it has thickened (and it’s a good idea to open it and check), the ice cream needs to rest, which it did in the shade while we ate spicy chicken. Periodically someone would get up from the table “to get something” and wander off for a bit, returning licking their lips. The finished product, strawberry ice cream in all its glory. The ice cream was pretty good. Way better than commercial ice creams, richer, thicker, creamier. However, because the strawberries hadn’t been broken down enough, it was also icier. My professional ice cream making experience included extensive works with fruit based ice creams and sorbets–had I been there when the custard was being made I would have made sure it was properly pureed so that the strawberries distributed evenly throughout and didn’t form pockets of ice. The other alternative would have been to suspend the strawberries in syrup, which would have forced the water out. Personally, I prefer vanilla ice cream with fresh strawberries on top, still warm from the sun. My favourite ice cream flavour of all time is chocolate chip, and that’s what I’m going to lobby for next time. Better yet, I’ll steal the ice cream maker and create this delicacy myself.